When my Grandparents Frank and Caterina Miranda migrated to Australia they went to work in Griffith, NSW. Griffith, 700km west of Sydney and 500km north of Melbourne was a small country town founded on returned soliders from WWI being given small allotments for their service. The area became a rich fruit growing region because of the Murrumbidgee Irrigation System, this was a big draw card for the Italian migrants of the time because they were able to set up farms and supply the big cities with fresh fruit and vegetables. 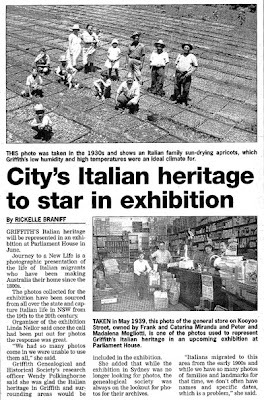 The New South Wales government is putting together an exhibition in June, my grandparents are in the photo above which was published in the Area News (local Griffith newspaper) on 2nd April, 2008.